As part of the new fast-food mobile technology revolution, everyone everywhere will eventually be able to customize their order on their phone and pick it up without waiting in line (it makes present-day fast food look, well... not so fast). 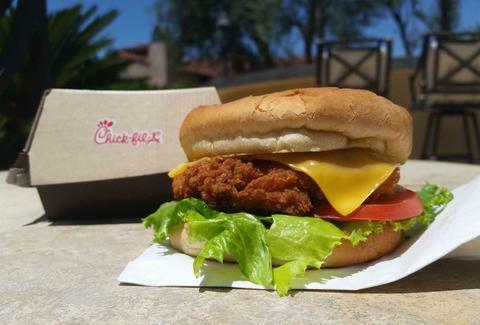 Taco Bell's already on it, and now Chick-fil-A is getting in on the game as well -- customers at 132 stores around the country will now be able to order in advance using their mobile app. No more waiting for waffle fries. While the service won't be available for breakfast, you can still order your chicken ahead of time and either pick it up in the store or get curbside service. And to ensure that nobody gets room-temperature food, the order is only finally prepared when you check in at the restaurant itself on the app. It'll even remember your recent orders and allow you to pay at the push of a button. Currently, order-ahead is only available in Atlanta, Chicago, Houston, Los Angeles, Orlando, and Washington DC, but they've got plans to roll it out to even more cities in 2015. Until then, the rest of us are in a bit of a pickle. Adam Lapetina is a Food/Drink staff writer for Thrillist, and hopes they introduce it in New York soon, even though there's only one location... in a college dining hall. Read his musings at @adamlapetina.